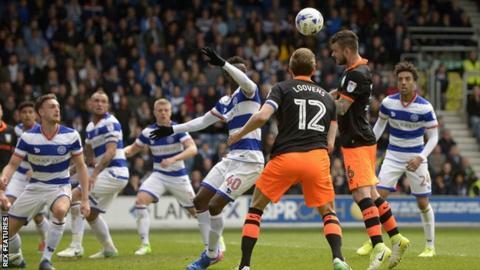 Goals from Adam Reach and Daniel Pudil ensured Sheffield Wednesday remained in the play-off places with a win at QPR. Reach smashed into the bottom-right corner in the 12th minute to give the visitors the lead before Idrissa Sylla equalised eight minutes later. Pudil then headed the Owls back in front on the rebound after Jordan Rhodes' effort was saved. Wednesday move up to fifth in the table, two points ahead of Leeds, who drop to seventh after defeat by Wolves. Carlos Carvalhal's Wednesday now have three games left to secure a second successive play-off finish with a home game against sixth-placed Fulham on the final day looking crucial. They withheld QPR's strong push for an equaliser in the closing stages to seal their fourth straight win. In comparison, Ian Holloway's side have now lost five games in a row and are yet to mathematically secure their Championship status for next season. Rangers are 17th in the table on 50 points, six points above Blackburn in the final relegation place. "We are very strong mentally - the mentality of this team is very strong. "When you play twice in three days, physical teams can cause you problems and it's not easy to play twice in such a short time. "But we are very strong and the confidence is high. We have four wins in a row and the mentality is really strong, which is why we achieved the three points today." "It's just very frustrating. It would be nice to get three points and leave us with only six to play for. "If we can get three in the next game at Brentford then everybody can just breath and we can start again. "Did we deserve to lose? Honestly? No. I think that's a draw, but unfortunately they saw it out and we didn't." Match ends, Queens Park Rangers 1, Sheffield Wednesday 2. Second Half ends, Queens Park Rangers 1, Sheffield Wednesday 2. Hand ball by James Perch (Queens Park Rangers). Offside, Sheffield Wednesday. Daniel Pudil tries a through ball, but Atdhe Nuhiu is caught offside. Attempt saved. Jake Bidwell (Queens Park Rangers) right footed shot from outside the box is saved in the bottom left corner. James Perch (Queens Park Rangers) wins a free kick in the defensive half. Foul by Jamie Mackie (Queens Park Rangers). Attempt missed. Luke Freeman (Queens Park Rangers) left footed shot from outside the box is high and wide to the left following a corner. Corner, Queens Park Rangers. Conceded by Adam Reach. Attempt missed. Matt Smith (Queens Park Rangers) header from the centre of the box is close, but misses to the left. Assisted by Jake Bidwell with a cross. Attempt missed. Idrissa Sylla (Queens Park Rangers) header from the centre of the box is high and wide to the right. Assisted by Kazenga Lua Lua with a cross following a set piece situation. Attempt blocked. Fernando Forestieri (Sheffield Wednesday) right footed shot from the centre of the box is blocked. Assisted by Atdhe Nuhiu. Attempt missed. Daniel Pudil (Sheffield Wednesday) header from the centre of the box is too high. Assisted by Barry Bannan with a cross following a corner. Corner, Sheffield Wednesday. Conceded by Jake Bidwell. James Perch (Queens Park Rangers) is shown the yellow card for a bad foul. Substitution, Sheffield Wednesday. Atdhe Nuhiu replaces Jordan Rhodes. Substitution, Queens Park Rangers. Matt Smith replaces Ryan Manning. Foul by Adam Reach (Sheffield Wednesday). Attempt missed. Kazenga Lua Lua (Queens Park Rangers) right footed shot from outside the box misses to the right. Assisted by Luke Freeman. Offside, Queens Park Rangers. Joel Lynch tries a through ball, but Conor Washington is caught offside. Foul by Jordan Rhodes (Sheffield Wednesday). Corner, Queens Park Rangers. Conceded by Josè Semedo. Substitution, Sheffield Wednesday. Josè Semedo replaces Ross Wallace. Attempt missed. Barry Bannan (Sheffield Wednesday) left footed shot from outside the box is just a bit too high. Attempt blocked. Gary Hooper (Sheffield Wednesday) right footed shot from outside the box is blocked.